UV (ultra-violet) LEDs can produce eye-catching effects when their light is allowed to interfere with certain colours, particularly with reflected light under near-dark conditions. Also try shining some UV light on a diamond… Most UV LEDs require about 3.6 V (the ‘blue’ diode voltage) to light. 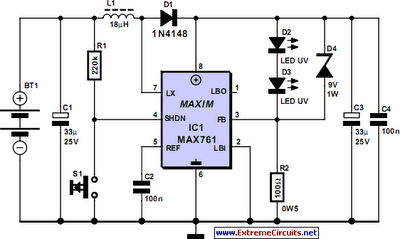 Here, a MAX761 step-up switching IC is used to provide constant current to bias the UV diode. The IC employs PWM in high-current mode and automatically changes to PFM mode in low or medium power mode to save (battery) power. To allow it to be used with two AA cells, the MAX761 is configured in bootstrapped mode with voltage-adjustable feedback. Up to four cells may be used to power the circuit but they may add more weight than you would like for a torchlight. To prolong the switch life, R1 is connected to the IC’s SHDN (shutdown) pin. Less than 50 nA will be measured in shutdown mode. Electrolytic capacitor C1 is used to decouple the circuit supply voltage. Without it, ripple and noise may cause instability. The one inductor in the circuit, L1, may have any value between about 10 and 50 µH. It stores current in its magnetic field while the MOSFET inside the MAX761 is switched. A toroid inductor is preferred in this position as it will guarantee low stray radiation. D1 has to be a relatively fast diode so don’t be tempted to use an 1N400x because it has a too slow recovery time. The circuit efficiency was measured at about 70%. R2, the resistor on the feedback pin of the MAX761 effectively determines the amount of constant current, I, sent through the UV LEDs, as follows: R2 = 1.5 / I where I will be between 2 mA and 35 mA. Zener diode D4 clamps the output voltage when the load is disconnected, which may happen when one of the UV LEDs breaks down. Without a load, the MAX761 will switch L1 right up to the boost voltage and so destroy itself.